Iraq Attack Kills At Least 15, Wounds Dozens : The Two-Way The coordinated suicide attack targeted the police headquarters in the oil-rich city of Kirkuk. No one has claimed responsibility, but the city is claimed by both Kurds and Arabs. Iraqi security forces inspect the scene of a bombing in Kirkuk, 180 miles north of Baghdad on Sunday. The death toll from the coordinated attacks in the oil-rich city of Kirkuk has risen: The BBC says at least 16 people are dead, while Al Jazeera puts the number at at least 30. At least 15 people are dead and 90 wounded in the Iraqi city of Kirkuk on Sunday following a coordinated suicide attack on the local police headquarters. "The blast in Kirkuk appeared to be a fresh attack by militants seeking to undermine government efforts in maintaining security nationwide. 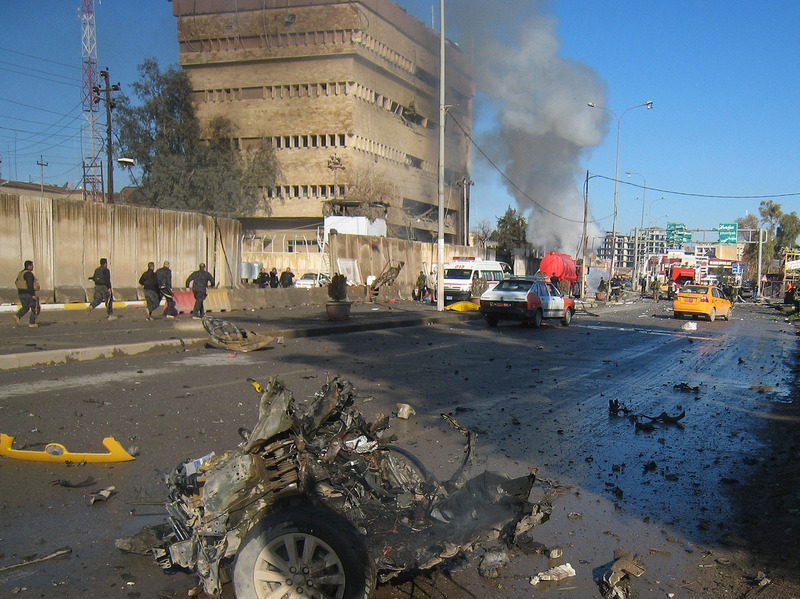 "Two police officers said the car bomber drove his vehicle into the Kirkuk headquarters, after which a second car bomb — parked rather than driven — also went off. Then, two suicide attackers on foot armed with machine guns and grenades tried to break into the station, but were killed before they could enter the building and set off their explosive-rigged belts." Kirkuk, an oil-rich city, is a complicated ethnic mix of Kurds, Arabs, Turkmen and others. "The question of whether it belongs to the autonomous Kurdish region in the north or to the Arab-dominated central government of Baghdad has long been a point of contention," NPR's Kelly McEvers reported in December 2011. "Kurds want to regain control of a city they say was once theirs. Arabs don't want to let go of a city that they settled in, at the encouragement of Saddam [Hussein]. Turkmen, Christians and other ethnic groups are caught somewhere in the middle."